Although they comprise one of the three fundamental branches of life, it was only the last decade that Archaea were formally recognized as a group alongside Eukaryotes and Bacteria. Bacteria-like in that they are single celled organisms that lack a nucleus and intracellular organelles, the Arachaea also share a large gene set typical of eukaryotes, for making and repairing DNA, RNA and protien. More surprisingly, they only inhabit environments typical of the extremes of early earth--hot springs, thermal ocean vents, saline lake, or oxygen deficient sediments. A breakpoint on the common evolutionary path, it is evident that the Archaea diverged early in the history of life, establishing thier importance in evolutionary sciences. 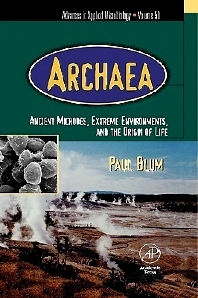 Archaea: Ancient Microbes, Extreme Environments, and the Origin of Life tells this evolving story, furthering our understanding of the microbe commonalities, and providing for evolutionary justification in the use of archaea as mechanistic model systems. School of Biological Sciences, University of Nebraska, Lincoln, U.S.A.